Aspendos is 44kms far way from Antalya city center and is about 4 kms away from Antalya-Alanya highway. Aspendos has a big fame with its spectecular Roman theatre not only the best preserved theatre in Turkey but also in Mediterrenean countries. Aspendos was founded on two hills and became one of the richest cities in the region in antiquity. 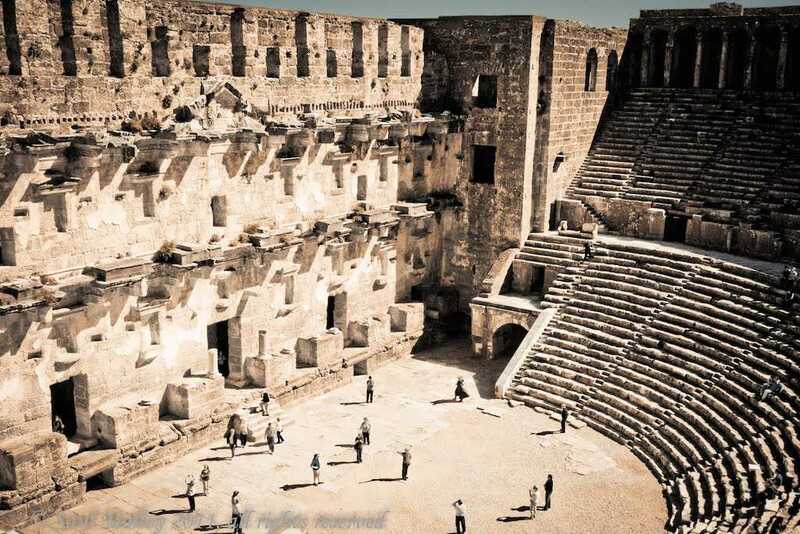 Today it is a stop for visitors to see the splendid Roman theatre preserved in better conditions and many festivals are held in this beautiful theatre either by art associations or Turkish goverment as international activities. According to Greek legend, the city was founded by Argive colonists who came to Pamphylia in leadership of hero Mopsos from Athens after the Trojan War. Aspendos did not play an important role as a political power in Hittite period but later it was a good settlement in Lycian period and it was occupied by the Persians in 546 BC. During the Persian rule, Aspendos continued to mint her own money showing the importance and autonomy. In 467 BC, The statesman and military commander Cimon destroyed the Persian navy and their fleet of 200 ships by a sudden attack based at the mouth of the river Köprüçay. Later the city was seized again and used as a base by the Persians. 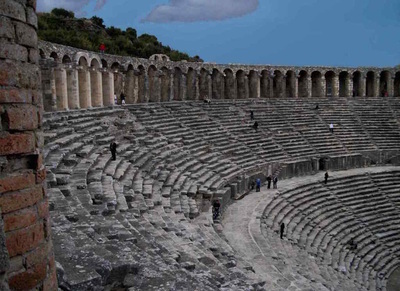 When Alexander the Great conquered Perge in 333 BC, The people of the Aspendos sent messengers to Alexander to ask him not wanting heavy taxes paid previously to the Persian kings if Aspendos surrender without a fight. After the agreement, Alexander went to Side leaving a garrison in the city. After the death of Alexander, Aspendos came under the control of the Ptolemies and the Seleucids, then it fell into the hands of Pergamum Kingdom in 133 BC. In 79 BC Cilician Gaius Verres had plundered Aspendos and later it baceme a Roman town in province of Asia. Aspendos reached heyday as the other Pamphylia cities in the second and third centuries AD. 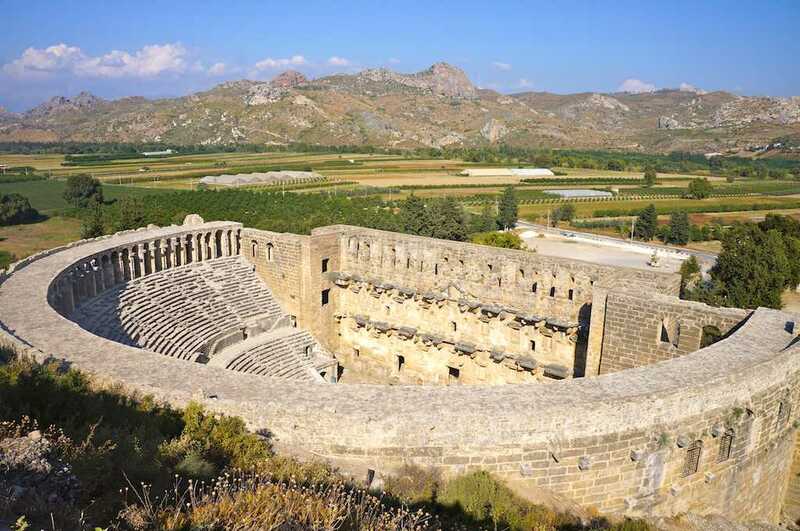 When the Roman empire was divided into two parts, Aspendos was considered as Byzantine town and it lost its importance. After the Arap raids in 10th and 11th centuries AD, Turks began ruling the whole area in 13th C AD as a Seljuk settlement for nomads and finally became an Ottoman town in 14th C AD. When Turkey was refounded in 1923, Aspendos was added to Antalya city as a small town. When the visitors come to Aspendos, they are astonished at Roman theatre at once due to its beauty. It is the best and most complete Roman theater functionally ever built. The theater was built on a hill slope according to the Greek tradition. Today visitors enter structure through the door which was built during the Roman period. In fact, the original entry used to be vaulted paradoses at both ends of the building scene. The cavea-spectators ‘seat- is semi-circular and is bisected by a wide diasoma. Theatre has twenty-one rows of seats above and twenty rows below-as rich seated below and poor above-classification. Sprawling stairs were made to sit in the audience of the challenges. The arched galleries with 59 extends were made in a later date from one end to the other of the upper cavea. As a general rule of the protocol, lodges above the entrances on both sides of the cavea are reserved for the imperial family. First row for the senators, judges, and ambassadors and the second row for other notables of the city were reserved taking up starting from the orchestra and other parts of the theatre were used for the public. The women usually sat in the upper rows under the galleries. The theater has a seating capacity of 20,000 spectators. The most striking element of the theater is the stage building without a doubt. Two-storey stone masonry building has five doors providing the debut of the artist under the lower floor. There is a a large door in the middle known as the porta regia and are two small doors on either side of the port known as hospitales. The small doors at orchestra level open to long corridors where the wild animals were kept. 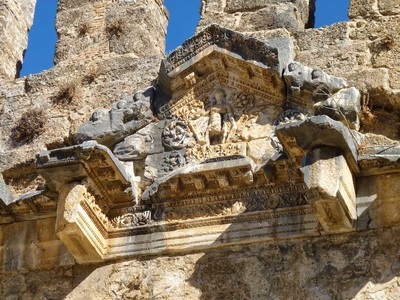 Dionysus relief, god of wine, is on the colonnaded upper floor in the middle of the pediment as founder and patron of the theater. The upper part of the stage building is covered with a highly ornamented wooden roof. 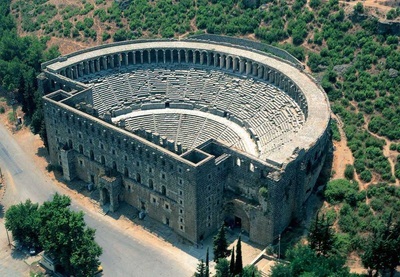 Aspendos theatre is very famous for its remarkable acoustics. Even the slightest sound created at the center of the orchestra can be heard easily from the upper galleries. 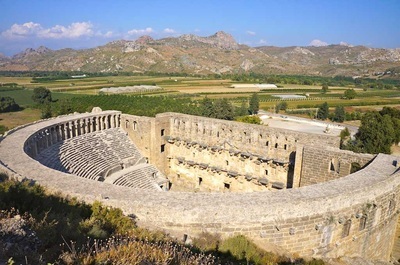 We know that Aspendos theater was built during reign of Emperor Marcus Aurelius in 165AD by the architect Zeno Theodoros from an article in the southern parados. No fee was charged for a performance in the theater. The tragedies sometimes used to take long hours so there used to be some stores in the upper galllery for spectators. 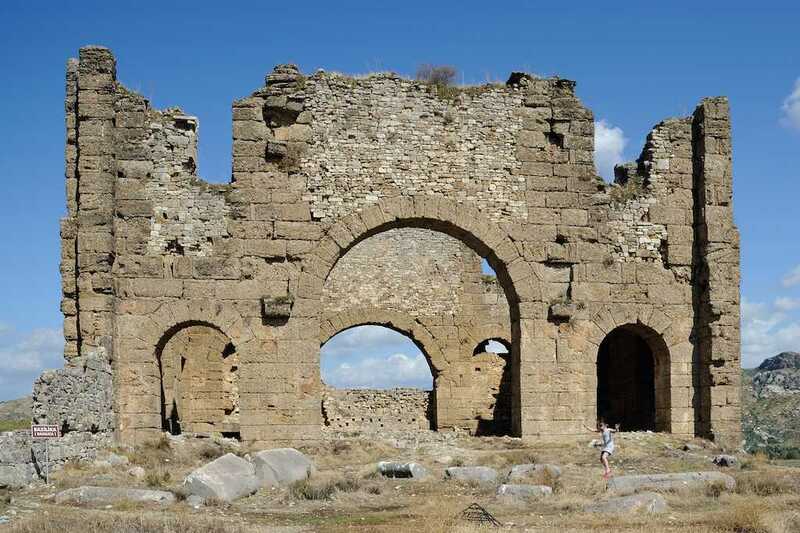 One of the most important historical buildings in Aspendos is a Roman aqueduct. 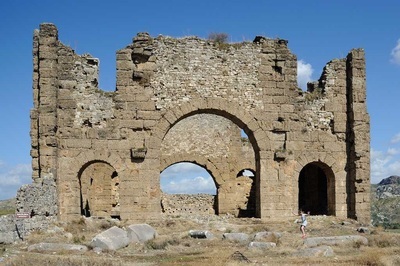 A series of arches that expose the extraordinary feat of engineering was used to bring the water into the city from the north mountains about 5kms far way and they are one of the rare surviving examples of ancient times. Water was brought to the city through a channel formed by carved stone blocks on the belt 15 meters high from the water source. The water was collected in towers 30 meters high at the end point of the arch in both sides, filtered by using pebbles and coals then was distributed to all parts of the city by earthenware-pipes. An inscription found in Aspendos tells us the aqueduct was built by Tiberius Claudius Italicus as a gift to the city in 2nd century AD.